This week saw the launch of Terminator Salvation, the fourth of the science fiction series that describes a future where machines have taken control of the planet. Whilst Jim Cameron's spectacle is obviously some way from the truth, developments in artificial intelligence mean that computers are getting smarter. The semantic web for example signifies a step change in the level of understanding from machines. 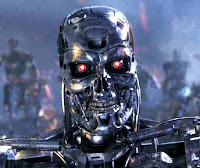 There is a terminator already evident within the online community that holds the power to kill. It doesn't kill people directly however but it can destroy online businesses. One of the greatest strengths of the internet is that it has broken down the barriers to entry for entrepreneurs and small businesses to establish themselves. Initially it created a level playing field for all advertisers. Increasingly in the last few years, it has become tougher to find a successful niche. One of the reasons behind this is that the risk of diffusion of innovation by the online giants is too high. For example, imagine an online analytics startup in 2003 (Not Urchin!). They would have had to produce a business plan, acquire finance and invest considerable time and resource into developing their solution. All of a sudden Google Analytics is released, for free. There has been a recent trend towards online conversion with specialist optimisation agencies such as Tamar and Maxymiser working with advertisers to ensure that the converiosn journey is a fluid as possible. As soon as Google brought out Website Optimiser, what happened to the profits for these companies? I recently discovered Google Merchant Search. Whilst this is only in Beta in the US and available purely to the finance sector, imagine the damage it could do to the price comparison community? Google Wave is on the horizon and has the potential to dramatically affect the way in which live communication manifests itself online. How does this affect organisations that are providing Live Assistance software? have on your Hitwise subscription? How does Gmail affect your corporate choice of email provider? And how had Google Maps affected online cartographers. As I implied in my previous post, Google controls the online customer. They have the power to decimate a large number of online businesses without significant material investment. Of course Google could never threaten to become the equivalent of the fictional Skynet. After all they do no evil.